A polynomial is the sum of multiple terms where the terms are raised to different powers of the same variable. Polynomials do not have fractional exponents (e.g. square roots), negative exponents, or variables in the denominator. To operate on polynomials, enter all arguments as they appear in the problem with one expression per line. 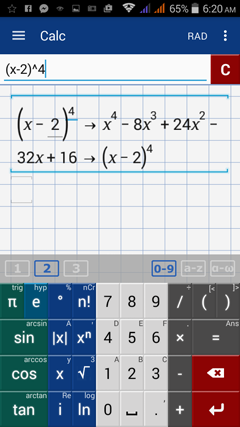 Use the x (variable) key to cycle through variables (x, y, z, θ, r), or use the a-z keyboard. 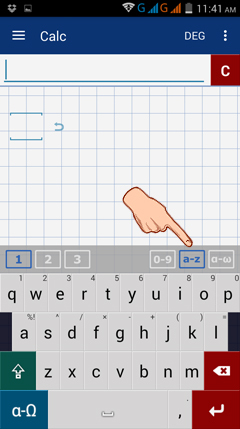 Switch back to the 0-9 keyboard to enter operations and exponents. Polynomial expansion means expanding a product of sums through distributing rules such as FOIL (first, outside, inner, last). For example, (x + 2)(x + 3) expands to x^2 + 5x + 6. To expand a polynomial, enter all arguments as they appear in the problem and write one expression per line. Find variables y and z under the x​ variable. Factoring a polynomial means breaking a polynomial into simpler parts (factors). For example, 2x^2 + 3x - 2 is factored into (2x - 1)(x + 2) because (2x - 1)(x + 2) = 2x^2 + 3x - 2. So (2x - 1) and (x + 2) are the factors of 2x^2 + 3x - 2. To factor a polynomial, enter the arguments as they appear in the problem. Enter one expression per line. To see an individual solution, enter one polynomial per workspace. Note: The app expresses factors in the form: x - c. For example, 2x^2 - 13x + 15 is factored into 2(x - 3/2)(x - 5). To avoid fractions, multiply the coefficient "2" across (x - 3/2) such that 2(x - 3/2)(x - 5) = (2x - 3)(x - 5) = 2x^2 - 13x + 15.